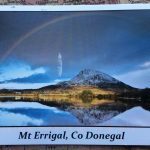 Rachel sent this card from Mt Errigal, it is the highest peak in Donegal at 751m. It is especially known for its beauty at sunset when the quartzite crystals on the bare rock catch the light and give the mountain its pinky glow. Quartzite used to be sandstone before it was crushed and heated under immense pressure by tectonic forces. And sandstone itself used to just be sand, perhaps an ancient sandy desert or the ocean floor, solidified and turned to stone by eons of time.